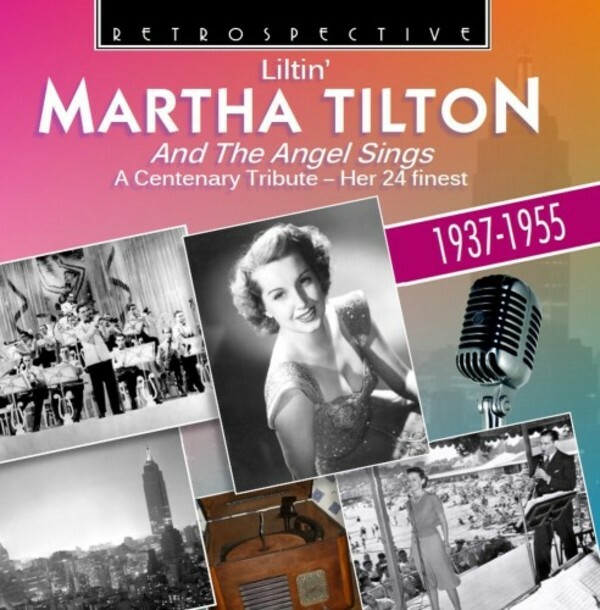 14th November 2015 marked the actual centenary of Texan songstress Martha Tilton. ‘The liltin’ Miss Tilton’ is best remembered as the glamorous angel who sang in front of the great Benny Goodman Band for many of its biggest hits, especially And the Angels Sing. But she was more than just one of the many top female vocalists of the Swing Era; she went on to enjoy a successful solo career into the 50s that brought her half a dozen Top Ten hits and a cult following that never deserted her. ‘And the Angel Sings’ is Retrospective’s tribute. The first nine tracks are the most popular of the many she made with Benny Goodman (I let a song go out of my heart, This can’t be love, What goes on here in my heart? – all ‘top three’ – and the exuberant, 6:36-long Bei mir bist du schoen with the Quintet). She also has tracks with Artie Shaw (Now we know) and Gene Krupa (Drum Boogie from a 1941 film), before 12 solo hits displaying a wide range, from jazz to wistful ballads such as I’ll walk alone (a No.4 hit) or How are things in Glocca Morra? (No.8). And, giving a Goodman-esque symmetry to the whole programme, Martha closes with You turned the tables on me, which she featured in the 1955 film The Benny Goodman Story. This is now the finest available survey of her work. 2. Bob White, whatcha gonna swing tonight? 7. What goes on here in my heart? 19. How are things in Glocca Morra?